Policy Research Associates, Inc. (PRA) has selected four sites to participate in the Crisis Intervention Training Model Project. Selection was made after a competitive application process managed by PRA. 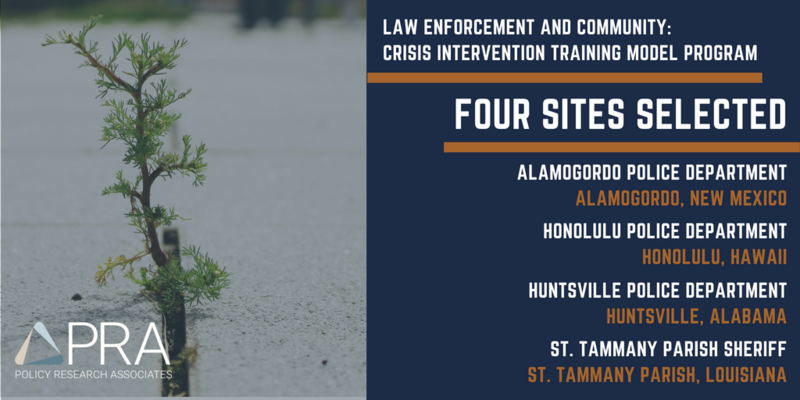 The Crisis Intervention Training Model project is part of a larger program within the Bureau of Justice Assistance’s Preventing Violence Against Law Enforcement Officers and Ensuring Officer Resilience and Survivability (VALOR) Initiative. This project is managed through PRA with its partners: the International Association of Chiefs of Police, CIT International, and the National Alliance on Mental Illness. The four selected agencies will work directly with PRA and its partners to strategically implement a comprehensive and sustainable Crisis Intervention Training strategy for their agency from June 2018 to May 2019. Through this program, agencies will improve their response to and interactions with persons with mental illness.